Choose classic cream blinds for a versatile look you’ll love for years to come. Find a range of plains and patterns in our collection. Forever in fashion, cream blinds will stand the test of time. Choose calming cream for the blinds in your living area to promote a relaxed atmosphere. With a choice of fabrics and accessories for a bespoke finish every time. 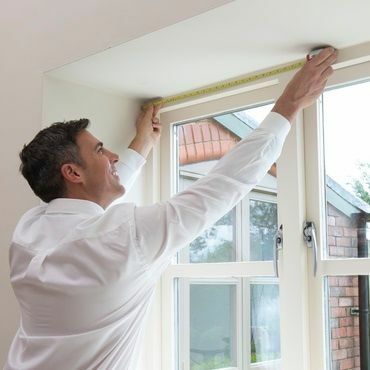 Expert measuring and fitting is included as standard. It’s all part of our dedicated in-home service. Hundreds of gorgeous fabrics and finishes to choose from. We’ll bring them all for you to browse during your in-home appointment. Choose cream Roller blinds from Hillarys then personalise your chosen design with matching braid, shaped hems, decorative poles or contemporary eyelets. Cream Roman blinds from Hillarys make an elegant addition to your interior. Cream Vertical blinds are a lovely choice for your home. 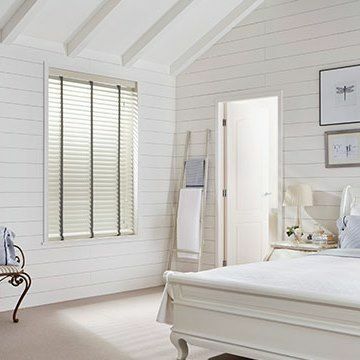 Cream Venetian blinds from our range are always a popular choice for home interiors. Cream blackout blinds will coordinate with almost any interior. And feature a sleep-friendly fabric! Here we show you how to use a range of shapes, tones and textures to add depth and interest to an all-white room. What makes cream blinds so perfect for so many interiors? The subtly stunning shade, for a start. Cream blinds are just off-white, benefiting from a gentle yellow tinge that helps them work with all sorts of colours. For a totally coordinated finish, you should match cream blinds with neutrals, yellows and whites. But to make a bolder statement, set your thinking behind colour combinations free, because cream blinds will go with almost every interior. Of course, there’s more to our range than straight-up cream blinds. Take a look at our blinds collection online: you’ll find botanical prints, textured finishes, baroque-inspired designs and more. And once you’ve browsed online, you can book a free home appointment to see how each of our cream blinds works with your interior. Cream blinds are an absolute must for all sorts of décor. You can team these off-white designs with neutral, black and bright interiors. In fact, you can match cream blinds with almost any colour scheme. But even with such flexibility, you want to make sure that the cream blinds you pick are the ideal style for your room. That’s why Hillarys offers an in-home service. Book an appointment and one of our advisors will bring our range to you, so you can see how cream blinds work with your décor. Your advisor will also be on hand with style tips and will measure up, before giving you a no-obligation quote.